Posted October 17, 2018 by lauterbachadmin | cs5711, Uncategorized. 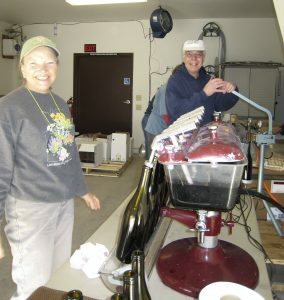 Two or three times a year have a wine bottling party. 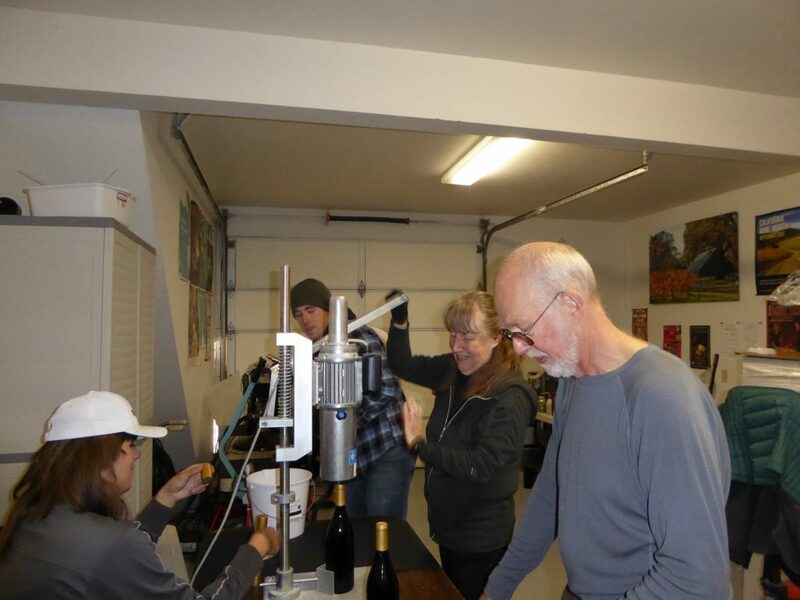 We have two bottling days coming up, our 2016 Syrah and our 2017 Rosé. This event is a party where we and a number of friends get together for the day, set up our line of 4 stations with 6 people and go at it. The first step is the filler. This is a beautiful antique device that gravity feeds the bottles. We maintain the wine level in the bowl with a sensor and pump. We place each bottle on a nozzle which acts as a syphon that fills till it meets the level in the bowl. 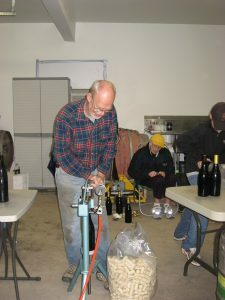 A cork is placed using a vacuum corker. This prevents have high pressure in the neck space of the bottle, preventing wine leakage around the cork. Next is a foil spinner, with 6 rubber rolls that compress the tin foils over the cork and neck of the bottle, giving that polished finish to the product. Finally a label applicator applies the front and back labels giving a finished product. 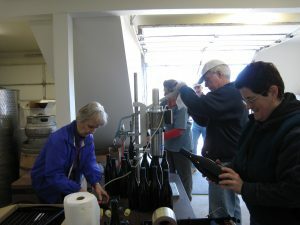 We have fabulous videos of the entire bottling line and bottling party in action. With our line running a full speed we can bottle 20 cases an hour. We generally shoot for about 100 cases a day. That’s a bottle every 14 seconds or so. 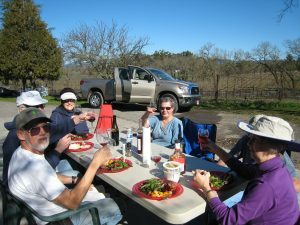 We delight the wine crew with a home made lunch, of course with some wine, and great company, The day works out to be a working party for all involved. 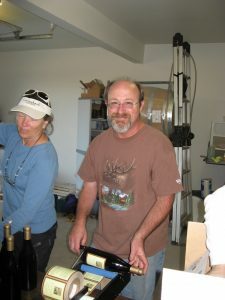 Our fall Lauterbach Cellars wine club shipment of a bottle each of our award winning Syrah Dessert wine (aka port), a bottle of estate bottled Pinot Noir, and a bottle of our Noir de Noir sparkling Pinot Noir Will be shipped in the next few weeks pending the weather.